Creating a professionally landscaped outdoor space can be a difficult task, but preparation and organization can cut down on mistakes. Many factors influence what plants will thrive together; things like necessary space, light and water requirements and special care considerations. Most plants come with instructions, but it is cumbersome to refer back to each individual tag when planning a project. In order to make the most efficient use of time, these factors should be logged in one easily accessible form. The Excel Landscaping Plants List provides a convenient and easy-to-use reference. The Landscaping Plants List is fully customizable and best of all can be downloaded from this page for free. First, fill in the customizable spread sheet with all each plant that is being considered for inclusion in a landscaping scheme. Choose anything that may fit the desired visual scheme as compatibility can be verified afterward. Second, using the included chart, check the zone hardiness to ensure that the chosen plants will survive the climate where they will be planted. It is important to factor in local climate when choosing the ideal assortment of plants. Third, use the information provided with each plant to fill in the spreadsheet. Be thorough as each characteristic of the plant will be important when determining the desired appearance and required maintenance of an area. Finally, be sure to note any special care requirements in the appropriate field. This can mean the difference between success and starting from scratch. First, include more types of plants than will actually be used in a project. It is possible that once all of the information is filled in, it will be obvious that certain plants are not compatible. Second, pay particular attention to space requirements, light and water allowances and hardiness. Choosing plants with similar needs will make upkeep significantly easier. Third, be sure to fill in accurate information regarding the usage of each plant. This will help to guide the landscaper regarding what part of the scheme a given plant can provide. Proper landscaping can add appeal to any property. 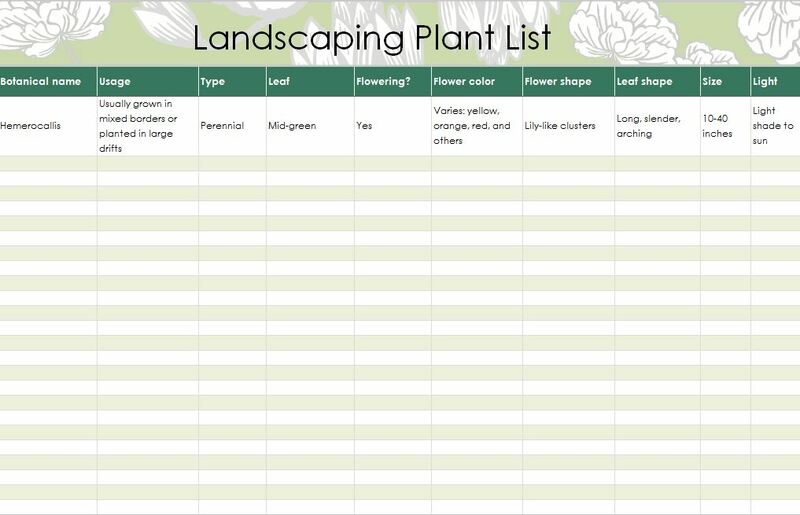 Download the Landscaping Plants List Excel spreadsheet and put the knowledge to landscape like a professional at your fingertips.